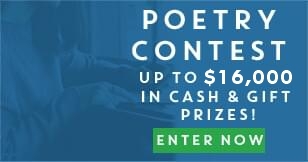 Enter your poem for a free chance to win up to $2,000 in cash and prizes! Our semi-annual contest awards 100 third-place poems, 20 runners-up, and one $2,000 grand prize. Use the poetry contest entry form below. You can submit a poem on any topic, employing whatever style you prefer. Check the Submission Guidelines on the right for the nitty-gritty details. For more information, read the official contest rules. Then, read the guidelines for poetry rating to get an idea of what our judges look for in a winning poem! Since we notify winners (and send their prizes) by mail, we must have either a physical address or PO Box on file for each participant. Secondarily, semi-finalists are invited to publish their poems if they so choose, and proofs are sent by mail to ensure poems are printed properly, without error. Contest judges are a well-rounded mix of editors and educators with extensive backgrounds in both writing and English literature. Whether MFAs in English or former professors, all judges have a broad knowledge of poetry, having either studied the discipline, taught it—or both.